The at NASDAQ listed Seagate Technology plc (STX) provides data storage technology and solutions. The company manufactures and distributes hard disk drives, solid state drives and their related controllers, solid state hybrid drives, and storage subsystems. The company offers external backup storage solutions under the Backup Plus and Expansion product lines, as well as under the Maxtor and LaCie brand names available in capacities up to 120 terabytes. It sells its products primarily to original equipment manufacturers, distributors, and retailers. Seagate Technology plc was founded in 1979 and is headquartered in Dublin, Ireland. In August with the help of a Low/High weekly up starting at 2016 Low, we`ve tried a short for the Major Downtarget Magnet, I expected to be worked off near 44$ - 42$ sometimes October-November 2018. But short`s have been stopped out, if I remember correctly, although the bearish signals after 2018 Rounding Top were really overwhelming. Above chart was presented on 08/10/2018 TOTD. Click here or on chart above to re-read this former view/forecast. There is a 100% precise confirmed falling light blue line I named "Gap Support Pivot on yearly base" This MAJOR FUTURE MAGNET starts at 2014 alltime-high (ATH) brakes at 2017 High and is origin of the "Rising 2018 Gap upmagnet, former support now resistance! In the end the "Gap Support Pivot on yearly base" had to be tested quite seriously and violently before the downtrend was allowed to end. And in the end the "Gap Support Pivot on yearly base" triggered the now running weekly upcycle which started at Xmas low, at same time final low of 2018, made at 35.38$. In the end downtrend was much harder as GUNNER24 Method has expected. It went lower as suspected 44$-42$ and lasted longer as expected Oct-Nov vs. December. Reason for this was that another open gap magnet had to be successfully tested back before the downtrend was allowed to finish. This gap magnet downtrend target is located at 34.94$, highlighted by the light-blue horizontal. This 34.94$ downtrend attraction wasn`t completely filled by 35.38$ 2018 Low, but very successfully tested back. Entire downtrend starting at 62.70$ // 2018 High was oriented to the falling 1st double arc resistance, which offered main resistance especially after "Rising 2018 Gap upmagnet" was finally hard broken to the downside, since and into 2018 Low no single week close above upper line of 1st was allowed to print and the week candles have been downwards oriented to the falling lower line of 1st double arc. Once the upper line of 1st was finally broken to the upside by # 5-close we had confirmation that a new weekly uptrend cycle was triggerd at # // 2018 Low. 2019 upcycle is now at week candle No. 12 and together with general market is able to print higher 2019 highs mostly week after week. Let`s name this uptrend 2019 upcycle cause the 1st double arc was lasting downtrend resistance until last trading week of 2018. Then something changed. Market became bullish after 2019 open... most part of 2018 the STX cyclewise was in downtrend. Suppose that this has changed after the start of 2019. Think cyclewise STX shares most of time in 2019 will be in uptrend...!!! 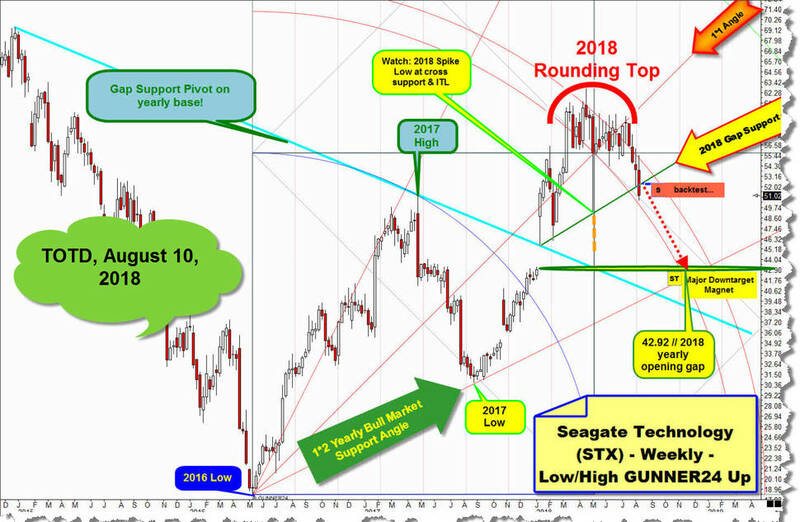 Watch how nicely confirmed the 1*2 Yearly Bull Market Support Angle now again offers rising support for the 2019 upcycle! 1*2 Yearly Bull Market Support Angle was always natural downtrend target, but initial strong support was heavily broken downwards in course of last leg of 2018 downcycle. The fact that the 1*2 Yearly Bull Market Support Angle is now re-broken to the upside is very bullish sign, this points substantially higher for STX. Watch what I expect to come for the shares and for midterm. This is expressed by the dark-green dotted arrow. Think it will test back 2018 high environment in course of summer 2019!, and usually there and then where 3 important magnets probably combine to form a future important triple magnet! 1. Lower line of 2nd double arc. Activated GUNNER24 Main Uptarget after most part of 2019 should be an uptrend year, and after 1*2 Yearly Bull Market Support Angle was re-conquered on weekly closing base and is offering strong support since weeks and last but not least overall 2018 resistance of 1st double arc was finally overcome according price. 2. Natural horizontal main resistance out of 2018 Top that is for ever at 62.70$. 62.70$ is resistance in the yearly time frame of course! 3. "Rising 2018 Gap upmagnet". Very important magnet in course of 2018, with origin at "Gap Support Pivot on yearly base". The origin of this confirmed important and usually very attractive future rail is marked by the little Key-symbol. Once a rail was confirmed important he is automatically always future backtest goal. Think 62.50$ is very important uptarget = triple upmagnet for the shares which should be worked off in course of summer. Perhaps in course of June-July! For this possible very important time magnet of 2019 uptrend continue to read. This is a weekly 12 Candle up starting at # 1 // 35.38$ // 2018 Low. 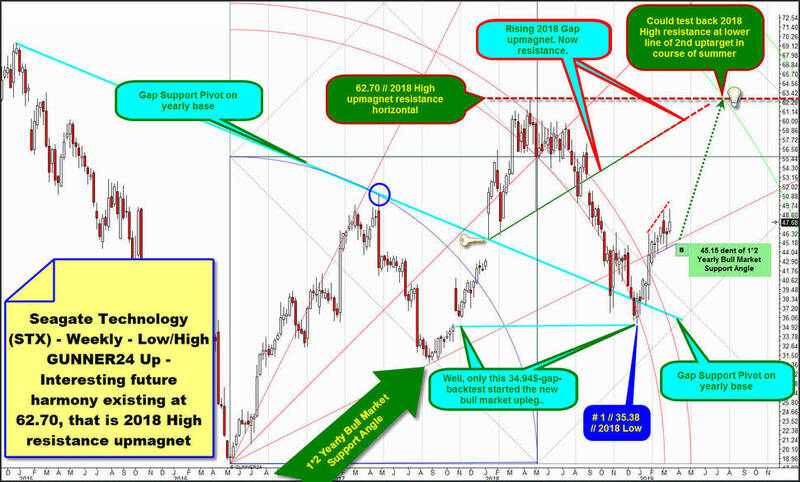 It measures from 2018 Low into current 2019 high, made at top of the week which is # 12 of 2019 uptrend cycle. Somehow this week candle looks like a shortterm bullish exhaustion is in. And that`s why there is a nice odd that the confirmed strong 2019 support of 1*2 Yearly Bull Market Support Angle will be backtested and dented one more time in course of the next few days/weeks. ==> Please by possible third dent of 1*2 Yearly Bull Market Support Angle or next pullback towards this re-conquered support on combined weekly and monthly closing base. Next test of 1*2 Yearly Bull Market Support Angle = main support for 2019 upcycle could be seen at 45.15$ or so if markets want`s to continue its now relevant small higher week lows pattern. ==> STX 1:3-Buy-Limit order at 45.15$! Watch where above calculated and derived 62.50$/summer triple upmagnet resistance can be located within weekly 12 Candle up. There the 62.50$ yearly resistance rail intersects natural lower line of 2nd double arc magnet for the possible uptrend months June-July 2019. 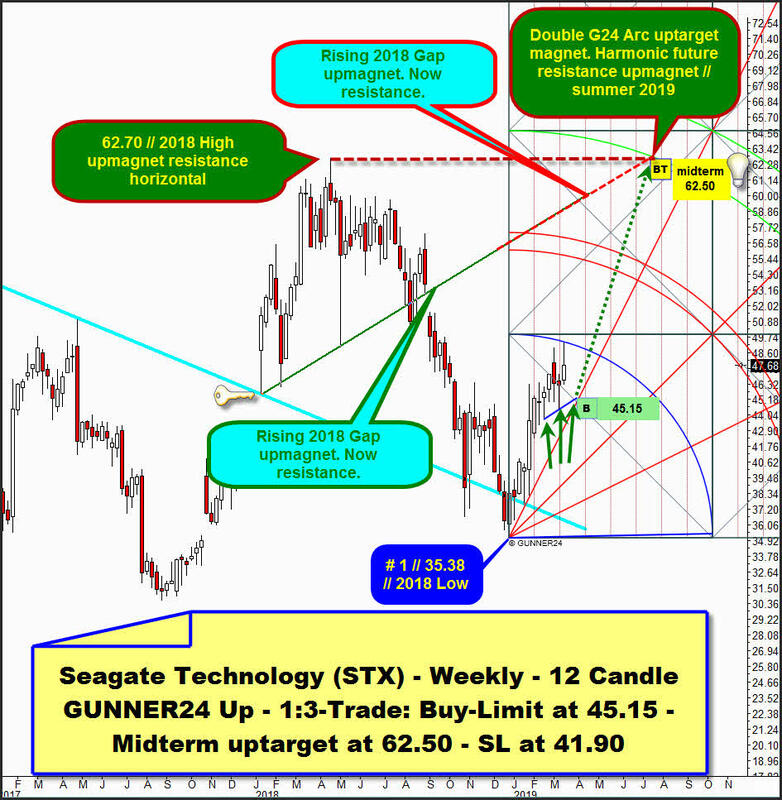 ==> STX shares have midterm uptarget at 62.50$! ==> Please place the SL for STX longs at 41.90$! Important announcement to my readers: Due to a family celebration that takes place coming weekend, the next Free GUNNER24 Newsletter will not be published until Sunday, the 31st of March 2019!